Belina's Adventures: Made in the USA.... how's that for a change? Made in the USA.... how's that for a change? Looki ng back through some of my posts I thought it was time for some good old fashioned AMERICAN FOOD after my world cuisine tour, so with this in mind I looked for great family friendly food, with US ingredients, that anyone can prepare.... But you can also say "what is American food if the US was formed by immigrants?"..... we've got all sorts of "Americanized" versions of world foods that are only found in the US while still giving you an idea of who inspired it....(Italians, Chinese, Mexicans and more are always complaining that "you'd never find this at home..."). Taste is always the #1 thing after all, but you should enjoy the process and have excellent results as well. The US has many wonderful meals that are completely "American" and can be made to show off the many regions.... doesn't matter if it's Southern, Northern, Western or Eastern - it's ALL great! So come with me for a little look through this great land and savour each and every dish! YUM! 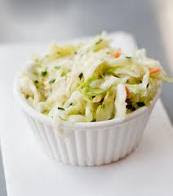 Cole Slaw.- I always think of Cole Slaw when I think "American".... I love it and think it goes with almost everything. Easy to make and gets better after being in the fridge...... a must if you're having a picnic! Great comfort food and what could be better than cole slaw at midnight? Finely dice cabbage and carrots. Place cabbage and carrot mixture into large bowl and add minced onions. Using regular blade on food processor, process remaining ingredients until smooth. (or mix in a bowl with a whisk). Pour over vegetable mixture and mix thoroughly. Cover bowl and refrigerate several hours or overnight before serving. 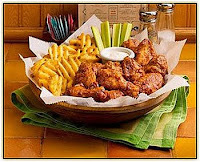 Restaurant Buffalo Chicken Wings.- Great for snacks, while watching TV, as an appetizer or to just gobble up! Use with the Ranch Dressing and hit a home-run! Heat oil in a deep fryer to 375 degrees F. The oil should be just enough to cover wings entirely, an inch or so deep. Combine the butter, hot sauce, pepper and garlic powder in a small saucepan over low heat. Stir together and heat until butter is melted and mixture is well blended. Remove from heat and reserve for serving. 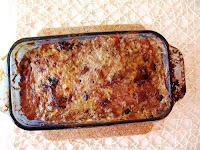 Meat Loaf.- My husband loves meatloaf and saves some for sandwiches the following day. You can also add a lot of "extras" to it like hard-boiled eggs, carrot & celery sticks, etc. to make a lovely presentation, whether you use beef, chicken, turkey or pork... it's all good. In a small bowl, combine tomato sauce, ketchup, Balsamic vinegar, brown sugar, Dijon mustard, Worcestershire sauce, and water/beef stock. In a large bowl, combine beef, bread crumbs, onions, green bell pepper, parsley, chopped garlic, egg, seasonings, 3/4 cup of tomato mixture, and optionally, Parmesan cheese. Form into loaf. Place into shallow 7 by 10 in. pan or bread loaf tin, lightly oiled. Pour remaining liquid over meat loaf to coat. Bake in a 350°F oven for one hour, basting occasionally with ketchup or your favorite barbecue sauce. NOTE: If adding the hard-boiled eggs and vegetable sticks, put half the meat loaf mixture into loaf pan, lay half the veggie sticks on the long sides of the pan leaving room in the middle to put the eggs in (all in a row lengthwise). Top with the rest of the meat loaf mix. You can use the bacon as a topping before putting into the oven, covering the top of the meat loaf. Place all ingredients together in large pan. Mix together making sure to coat all ribs with this mixture. Spread ribs out evenly on bottom of pan. Cover lightly with foil. Bake at 375 degrees for approximately 1 hour or until the rib meat begins separating from the bone. Then remove the foil and bake for another 15-30 min to allow rub to crisp. Old Fashioned Buttermilk Southern Fried Chicken.- If you love the flavor of deep fried chicken but you want to bake it instead, this oven fried chicken recipe will give you the best of both worlds. The chicken is soaked in buttermilk overnight to make it flavorful and moist. The chicken is then coated in flour and fried in oil before being finished off in a roaster. This is a very simple recipe and, as long as you don't mind soaking the chicken overnight, the perfect way to make an oven fried chicken recipe. To check when your chicken is done, pierce it and make sure the juices run clear. Heat oven to 350 degrees F. Put chicken in a bowl and cover with buttermilk, refrigerate overnight. Put flour and all the spices in a blender and combine well. Put the spiced flour in a zip lock bag. When you take the chicken out of the buttermilk, shake to remove excess, put a couple of pieces in the zip lock bag and coat each piece with prepared flour. Put the oil into a pan and brown the outside with oil. Then put in a roaster with water and bake at 350 degrees until done, about 45 min. Beer Batter Fish Strips.- Great tasting, crunchy fish. Also great with the Ranch Dressing or with some Malt Vinegar. Be ready to eat once it's done, the crunchiness is best then. Place beer in a bowl and add the flour. Whisk well until just combined. Allow to rest at least 1/2 hour and make sure you see some bubbles in the mix. Batter should be thick. Once it's golden brown, it's ready to serve. Lay on a colander or paper towels for a minute, then serve. NOTE: It seems as it's sticking to the bottom, but it will release easily once it's golden brown. You will be able to tell. Or if you try to move it with a spatula, it should move easily- if not, you will remove the batter from the fish, so pay attention. It's worth it. Also, you can use this batter for chicken strips, onion rings, vegetables and the most sinful beer-batter fries ever! YUM! Preheat oven to 325 degrees F. Grease a 10-inch Bundt pan with a nonstick spray and dust lightly with flour; set aside. In a medium bowl, combine the flour, baking powder, baking soda and salt. Set aside. In the bowl of a standing mixer fitted with the paddle, beat the butter and sugar for 3 minutes at medium speed. Lower mixer speed and add eggs, one at a time. Continue to beat for 1 minute. Alternate adding the flour mixture and buttermilk, ending with the flour. Add vanilla or rum extract. Beat on medium-high speed for 20 seconds. Pour batter into prepared pan, and bake for about 60 minutes, or until a wooden toothpick inserted into the center comes out clean. To make the glaze: In a small saucepan, combine sugar, butter, water and vanilla or rum extract. Do not boil. When the cake comes out of the oven, prick it with a wooden skewer or fork. Pour the glaze slowly over the cake. Let the cake cool completely before removing it from the pan. 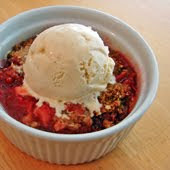 In a bowl combine the rhubarb, granulated sugar, and lemon juice, and mix to combine evenly. Pour into a lightly buttered 2-quart baking dish. In the same bowl combine the flour, brown sugar, cinnamon, oats, salt, and butter. Using a pastry cutter or a fork, cut the butter into the dry ingredients to form a very course, crumbly mixture. Spread the mixture over the rhubarb and bake at 375 degrees F. for 35 minutes, or until browned and bubbly. Serve warm. How about t hat for great American recipes, eh? I'd say pretty fantastic and you don't have to visit any imported food isle either as you should be able to find it all at your local A&P.... Plus, any day now winter will be over and everyone will be able to enjoy grilling and eating outdoors, picnics and just taking advantage of the backyard, and all these dishes will truly shine then. But it doesn't matter if it's the dead of winter, summer or late fall - these will taste just as great anytime.... even eating them in front of the TV. So let's hear it for American Food!